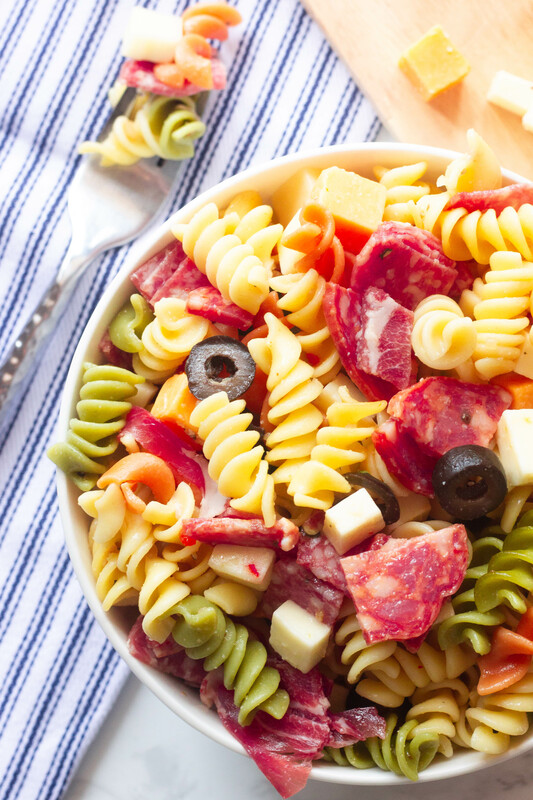 This Classic Italian Pasta Salad is bright, fresh and is packed with flavor! There are 3 different Italian meats and cheeses in this salad. This will make the perfect addition to any summer BBQ or party! This is the easiest way to make a pasta salad if you are short on time and need to make a quick side dish or appetizer. Everybody loves pasta salad so this dish is definitely a crowd pleaser. I make this for almost any BBQ or event we go to…especially in the summer! 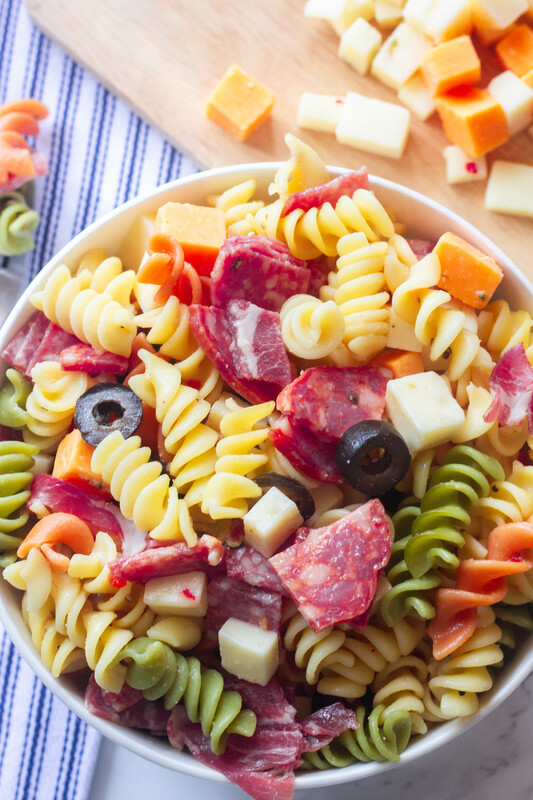 I load this Classic Italian Pasta Salad with cheese, salami and olives. The best part about this pasta salad is I use 3 different types of Italian meats and 3 different cheeses. I used Salami, Coppa, and Spicy Capicola.. and for the cheeses I always use Mozzarella, Sharp Cheddar and Pepper Jack. Combine all ingredients in a large bowl once the pasta has cooled. Add dressing and toss until all ingredients are combined. *I recommend refrigerating the pasta salad for at least an hour before serving. You can make this pasta salad in advance! I actually prefer to make mine the day before because the pasta will absorb all of the flavors of the dressing. I almost always make this pasta salad with just meats, cheeses and olives but you can add your favorites depending on what you love! Another favorite salad that is pasta-less and makes the ultimate salad for a sunny summer day is my Antipasto Salad. It has many of the same ingredients- instead of pasta I use lettuce and added a few other Italian favorites.